Cali & York demonstrates what it means to “pay it forward.” Thank you Jeffrey Farmer, President of Cali & York and Gregory Cannon, Director of Marketing, for making this generous donation possible. 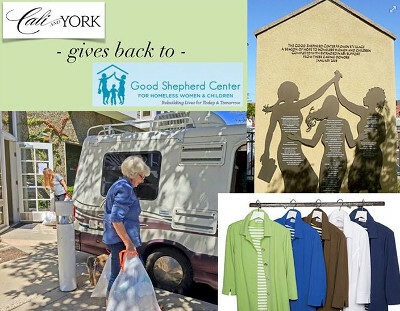 Volunteers, Donna Titley and Warren Hasselberger drove to Costa Mesa to pick up several large bags of new clothing that was donated by Cali & York and delivered them to Good Shepherd Center. The clothing will be distributed to the women as they go on job interviews and secure employment. 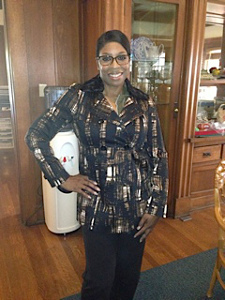 Good Shepherd Center for Homeless Women and Children, received a generous donation of interview clothing from “W by Worth”. Page Malloy, a board member and Professional Sales Associate for “Worth”, not only made this connection but showed up to help unpack the items and make sure that every women that received a referral for interview clothing walked away with at least two beautiful new pieces. Thank you Page, and thank you “Worth” for your amazing “giving back” program. Good Shepherd Center was selected by PharmaNet/i3 to be their charity partner, at their annual conference held in Los Angeles at the JW Marriott. Their VIP dinner was held on September 24, 2012 on the beautiful rooftop of the Grammy Museum, LA Live. 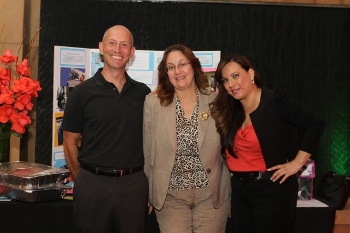 Andrea Salazar, Development Director had the opportunity to share the GSC story and show the GSC video. A number of participants approached Andrea with accolades on the good work GSC is doing. A money tree was created featuring handprints of our GSC children with their name and ages, listing amounts ranging from $5.00-$50.00. From the participants of the evening $1000.00 was raised for GSC. PharmaNet/i3 made an additional pledge to assist us with the services and programs we offer. Many thanks to all that contributed. These donations help support us in our mission to end the cycle of homelessness and to continue to provide services to those in transition with dignity and love.